On June 1, we began the third year of our Hubbard Fellowship Program, generously funded by Anne Hubbard through the Claire M. Hubbard Foundation. We brought in two new Fellows, Evan and Kim, to follow in the footsteps of Anne, Eliza, Jasmine, and Dillon. Between now and the end of next May, they will learn everything we can teach them about conservation and then go out into the world to become conservation leaders and professionals. Hubbard Fellows Kim Tri and Evan Barrientos at The Nature Conservancy’s Caveny Tract. I asked Kim and Evan to each write a short introduction describing themselves and how they got here. In some ways, the two of them are very different from each other, but I think you’ll see a striking similarity in the paths they’ve taken to reach us. I hope you’ll get to know them much better over the next year as they contribute their thoughts and images to this blog. Growing up in southeast Wisconsin I wanted to help protect nature, but I never could see myself working in the Midwest. To an aspiring wildlife biologist, it seemed that my home had lost all its nature a century ago to logging and farming. All that remained for me to explore were a few small nature centers and state parks surrounded by a vast expanse of corn, soybeans, lawns, pavement, and buildings. Nature worth exploring and protecting, it seemed, lay in faraway places like Alaska or the Amazon rainforest. Yes, I had heard that only about one percent of Wisconsin’s native prairies remained, but what good could I do to help those sad fragments of nature when there were pristine forests being logged just a continent away? In college a lot of these beliefs changed, fortunately. I worked in Alaska, Mexico, and Ecuador, and I discovered that even in those amazing places I could still miss the song of an American Robin. I saw how complex conservation issues are and learned that effective solutions often require decades to develop. Furthermore, it became clear that research alone wouldn’t be enough to achieve my conservation goals. Most importantly, I realized the extreme conservation impact of another species that I had previously ignored: humans. 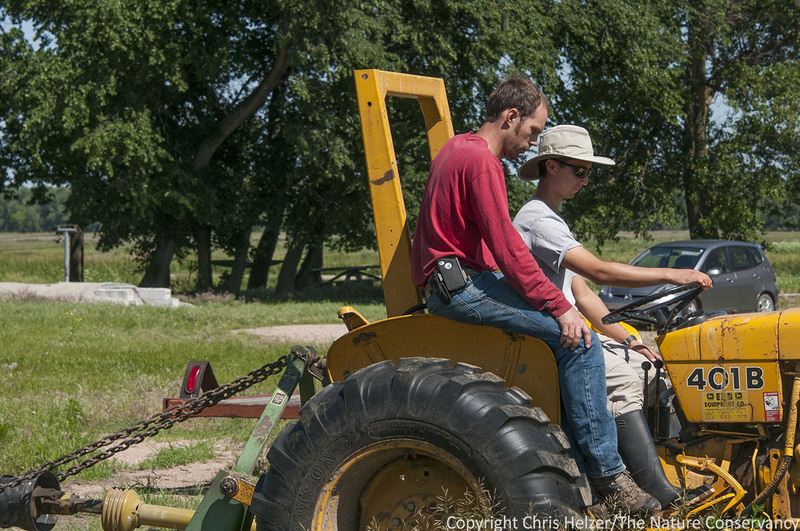 Our land manager Nelson Winkel teaches Hubbard Fellow Evan Barrientos (in hat) how to drive a tractor. After stepping out of childhood dreams and into real world conservation, I saw that at the root of nearly every conservation issue lies a problem with the way people view nature. As a result, I became fascinated with the numerous social aspects of conservation such as environmental education and sustainable alternative livelihoods. I remained interested in ecology, but wanted to study ways nature could benefit people and vice versa. Finally, by discovering the importance of working with people, I realized that if I wanted to achieve real and significant conservation solutions, I would have to work long-term within a community that I understood intimately rather than hop from one country to another. By the end of college I had learned that pristine wildernesses weren’t the only places worth conserving. Upon graduating, my conservation goals were to protect natural areas from human development, restore degraded natural areas, and engage people in the process. The Nature Conservancy embodies this philosophy, and I became eager to work with them. Astoundingly, The Hubbard Fellowship provided that exact opportunity. While I once may have dismissed Nebraska’s prairies as tame, I now seem them filled with fascinating species, deserving of restoration after a history of persecution, and located in a region that I can legitimately call home. I am thrilled to be working here and learning so much about how to restore biodiversity in degraded ecosystems. Though I grew up in southern Minnesota and prairies are a natural part of my life, my decision to study and work to conserve them took me kind of by surprise. Conservation has always appealed to me—I’ve always wanted to do something with my life. I just wanted to do it somewhere else. At 19, frustrated with the Midwest and my lack of having done anything, I left my first college for a year in a conservation corps in Arizona, followed by another year in northern Minnesota, to see mountains and deserts and forests, and do something. I credit where I am today to that first big move. It allowed me to really learn from the land and the people around me, to understand the value of loving your work, and to really have a focus upon returning to college. Sterling College in Vermont appealed to me then, partly because it offered the degree I wanted, but more importantly because of its dedication to educating the next generation of environmental stewards. It was there in the beautiful Northwoods that I realized that what I really wanted was the grass and open space I’d left behind. Running out of time to propose a senior project, the realization came in a “thunderbolt” moment. It had to be prairies. Without explicitly remembering learning the concepts, I already knew about fire and grazing, deep roots, and grass tall as horses. Presenting the prairie to my advisor so that she could appreciate it as I do was a fun challenge and valuable experience. Studying this ecosystem has been like coming home. It illuminates old memories of purple coneflowers at the local zoo and chasing voles across the black of a new burn near my house. 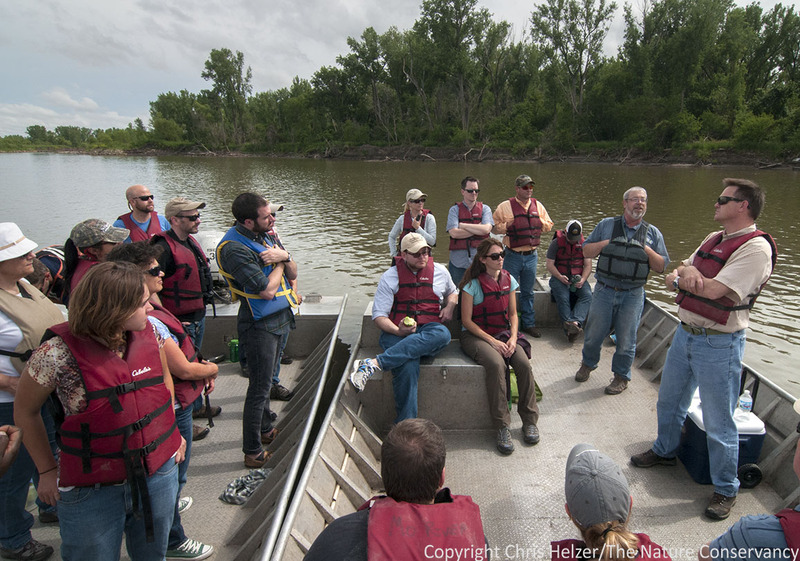 Kim Tri (bottom left) on a Missouri River boat tour in early June – part of a large conference of Nature Conservancy staff in Nebraska City. Having tallied up something like ten moves in the past four years, I am excited to spend the duration of the Fellowship really sinking into one place and becoming part of the natural and human community. I’m learning to put down roots, literally—the garden’s just getting going! The peace of the prairie, I believe, will provide a perfect space in which to become a better naturalist, ecologist, land steward, and artist, and learn how to put all of those facets of myself to work in protecting the land. I look forward, too, to the endless opportunities for professional development amid the blood, sweat, and tears of land management that will help hone the somewhat rough-and-tumble ecological education that I’ve received so far. Kim volunteered with us last year while working on a senior project for college. You can read more about her previous time with us here. This entry was posted in Hubbard Fellowship and tagged 2015-2016, anne hubbard, evan barrientos, hubbard fellowship, Kim Tri, nebraska by Chris Helzer. Bookmark the permalink. Kim and Evan, congratulations and best wishes for your noble journeys. Funny how the “far away places” are just outside your home’s back door. Restore, Conserve, and Preserve your home, turns out you are restoring, conserving and preserving the world, Dear Fellows! Both are blessings to Nebraska and the globe. THANKS! Looking forward to your posts, photos, art and musings, Evan and Kim! Welcome aboard one of the best ecological management learning opportunities there is! I work at a nature reserve with lots of managed native habitats, including extensive and diverse prairie plantings. Even if I never get up there (from eastern Missouri, where I live and work) to meet you during your year there, I have a feeling this internship will not be the last we hear of you. Kim: Boy do I know where you are coming from. As a young Navy wife moving from Nebraska to Connecticut was an eye opener in the 1970’s. All these trees and the winding roads, and I couldn’t watch the weather come in and all this shade. We were four years there and then we moved to the Idaho plains, where I could watch the weather move in. It was a fascinating area but it still wasn’t Nebraska plains. Five years later we finally made it back to Nebraska. Now I’m content. Thank you and Evan for your service to our plains and have a fabulous fellowship summer.